I now have a wonderful sketchbook sent to me by my friend Maureen. She added an outline of a left hand on the cover - my injured wrist - and added words on the spine re: drawings by my non-dominant hand. I'll photograph it and post it here soon. 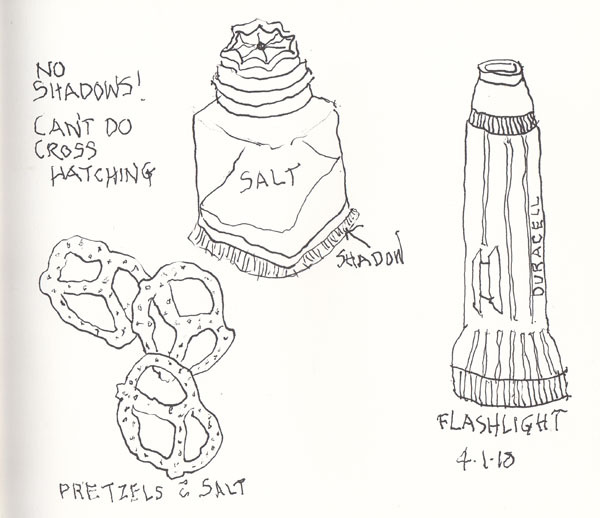 For now I am posting my 3 drawings done yesterday, in my kitchen, after breakfast. I am starting with objects from my environment, and have no idea where it will lead me. Hopefully I'll be out of the apartment more next week. 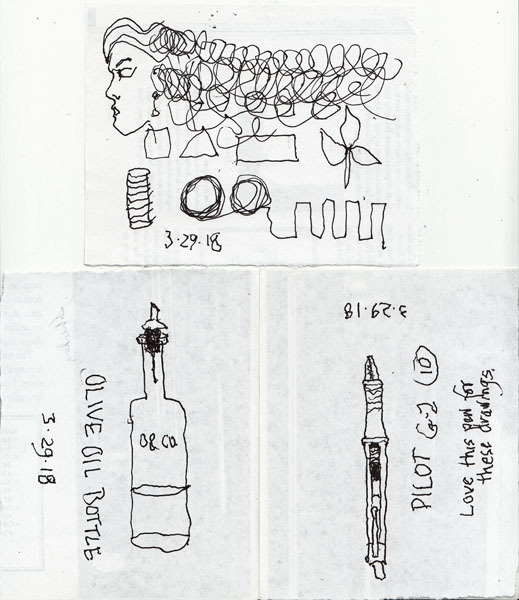 In the top drawing I was concentrating on shapes, and after making the lines of circles, I decided to add a profile to make it my hair, since it is my main failure as I approach life with a wrist fracture. I now have a cool cast for my Colles Wrist Fracture. The white portion is a gortex liner against my skin. 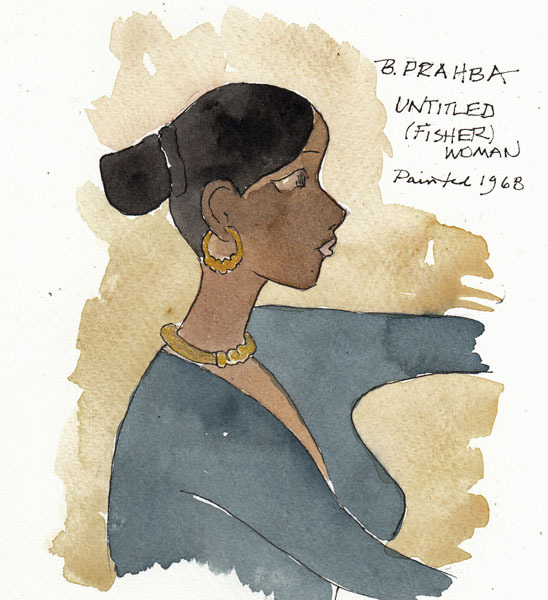 The cast is black - what else for a New Yorker? It goes with our black clothes! My major problem is my inability to comb, curl, or twist up my hair with a clippie. My husband is learning how to put an elastic on for a pony tail, and that is as far as we've gotten. 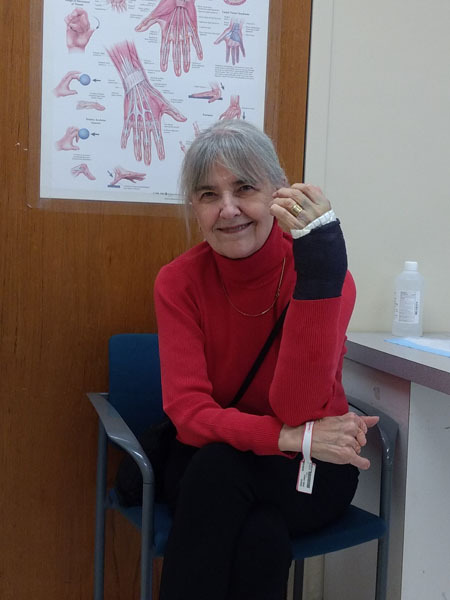 Thanks for all of the comments yesterday regarding my wrist fracture. 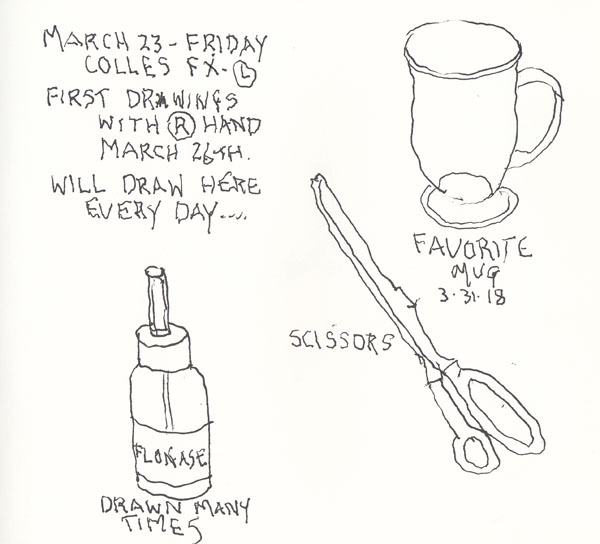 So many "art friends" recommended drawing with my non-dominant hand, and I decided it was worth a try. My Grandson and I spent several hours looking at my Family History Binders because he wanted to know how I found the information. Then he wanted to draw, so I joined him. 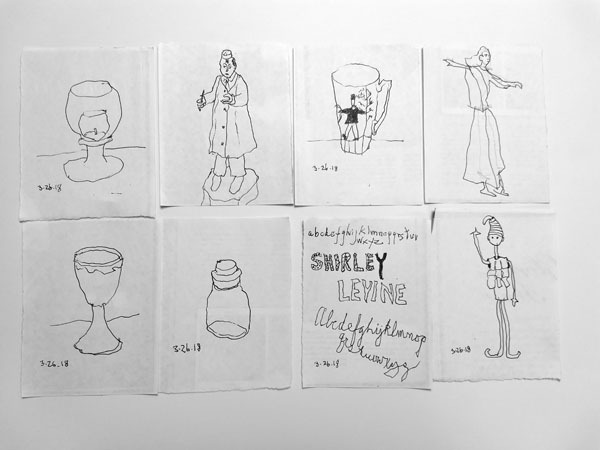 Here are my first attempts- drawn on scrap paper with ink. 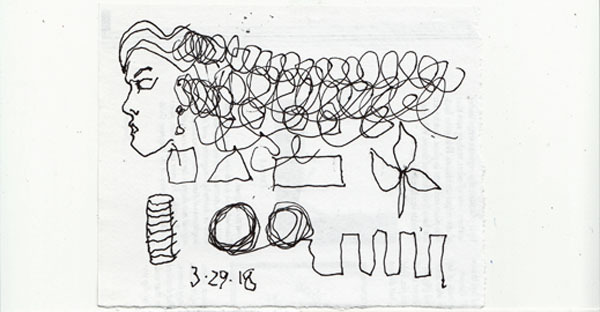 I went slowly, drawing random objects in the dining room, one photo of a model, and some letters. I love drawing on these copy paper scraps (1/4th of a sheet) because I have no expectation. I will enjoy looking through my bookbinding books to find a fun way to keep them together for this period of time. Several years ago I discovered that I really like contemporary Southeast Asian Art and during Asia Week there are auction previews at the NYC auction houses for this specific type of art. The auctions are taking place this week, and my friends and I went to the Preview at Sotheby's last Friday. 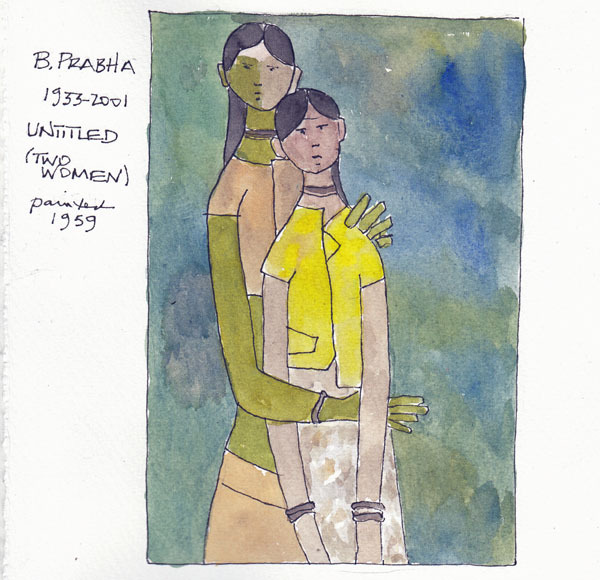 I love the paintings by B. Prabha (1933-2001) and painted one of her paintings and a detail of another. Please ignore my difficulties remembering how to spell her name. 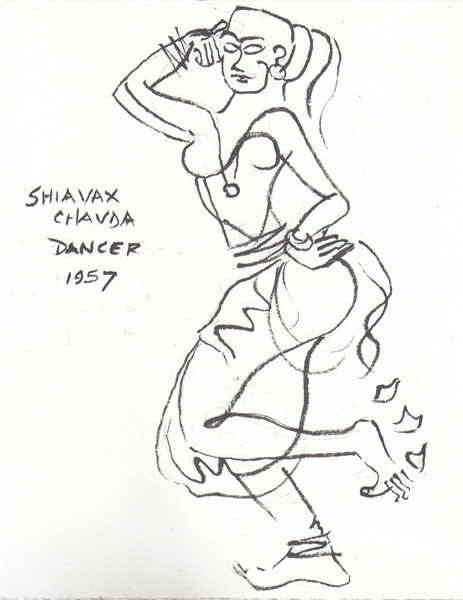 There were 3 drawings of dancers by Shiavax Chavda (1914-1990), and I sketched one to try to learn how he achieved such great movement in his drawing. 1. 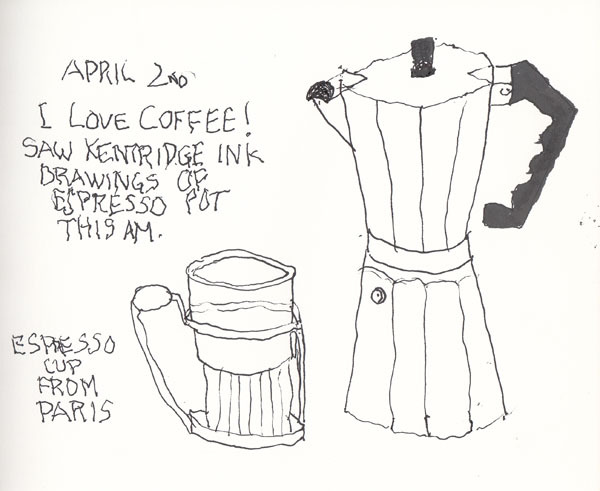 I want to have a sketchbook page that represents that day in my visual sketchbook, and at least one artwork I loved. 2. I learn so much by reproducing lines and their watercolor palette.